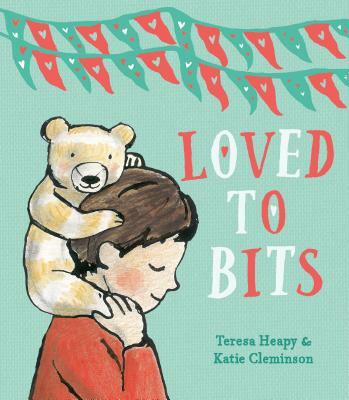 A wonderfully exuberant teddy bear and his little boy go on all sorts of grand adventures collecting stories (and a few scrapes and bruises) along the way in Loved to Bits, a picture book about friendship from Teresa Heapy and Katie Cleminson. Ted and his boy do everything together. They fight beasts and have feasts. They search, explore, escape. . . . and laugh. But sometimes things get rough, and Teddy loses an ear. He's still got his best one though, never fear! It's nothing—he didn't feel a thing! A leg, then the other. An arm, and then the next. What do you do with a broken Ted? You lay down with him at night and snuggle in bed. Teresa Heapy is an award-winning picture book author. Her books include The Marvellous Moon Map, illustrated by David Litchfield, and the Very Little picture book series, illustrated by Sue Heap: Very Little Red Riding Hood, Very Little Cinderella, Very Little Sleeping Beauty and Very Little Rapunzel. She lives in Oxford, England, with her family. Katie Cleminson is an author-illustrator living in Devon, England. Her picture books including Otto the Book Bear have won three awards, and have been translated into ten languages. Katie's work has been exhibited in London, Poland, Italy, Japan and Korea. Katie draws with an ink pipette, and often uses charcoal and watercolor paint in her work.